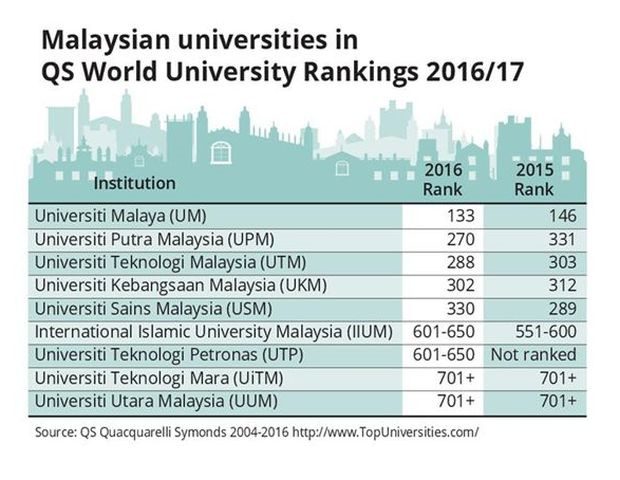 Universiti Malaya (UM) has continued to climb up the 2016/17 QS World University Rankings for the third consecutive year. It jumped from 146th last year to joint 133rd worldwide this year with Aalto University in Finland. UM was ranked 151 in 2014. 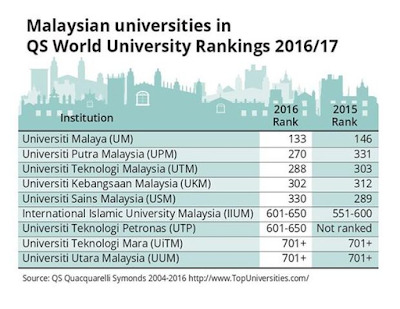 QS Intelligence Unit head of research Ben Sowter said UM was now close to becoming one of the world’s top 500 research institutions. Credits should be given to previous Universiti Malaya (UM) vice-chancellor (VC) Prof Tan Sri Dr Ghauth Jasmon if you understand how research works - it takes 2 to 3 years for a research publication from first submission to a few review revision rounds to get accepted and finally published (only then it counts in university research rankings). Research is an important aspects of QS World University Rankings assessment criteria. While the general academic staffs' sentiments towards Ghauth Jasmon was not really encouraging for being too pushy to force the academic staffs to publish research papers, it was him that actually improved the research outcomes and environment focusing on research above all. IMHO, Ghauth Jasmon left a little too early to see his hard work (strategies implemented, focus on research etc) comes to fruition. For the first time, Universiti Teknologi Petronas (UTP) also made an appearance, featuring in the 601-650 band. Sowter said it was also the only private university to make it into the World University Rankings.